For astronomers seeking Earth twins around other stars, the exoplanet GJ 1132 b probably isn’t an identical sibling—but it may be the closest cousin yet found. It weighs in at just over one Earth mass, but circles its star in a warm orbit that could make it more like Venus than our own world. Moreover, its diameter is nearly 50 percent larger than that of Earth, suggesting it possesses a thick atmosphere. Now, after taking the closest-ever look at GJ 1132 b, a European collaboration has confirmed the presence of its atmosphere and found hints it might contain water and methane. The results are currently under review for publication in The Astrophysical Journal. As mere discoveries of exoplanets become routine, efforts to learn more about them—their compositions, climates and histories—are moving to the fore, with studies of their atmospheres occupying center stage. Although astronomers detected the first exoplanet atmosphere more than 15 years ago, they have only managed to observe a handful ever since, mostly for very hot worlds as big as Jupiter or even larger. With their first glimpse of GJ 1132 b’s alien air, astronomers are now entering a new frontier as they examine the atmospheres of smaller, more Earth-like worlds. Finding the tenuous atmospheres around other worlds strains the limits of current technology. Luckily, GJ 1132 b has the advantage of being relatively easy to study, because it is only 39 light-years away—just a hop, skip and a jump across our cosmic neighborhood. It also orbits an M-dwarf, the smallest and coolest type of star, which allows astronomers to more readily probe the planet’s atmosphere. 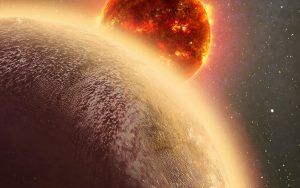 The team studied GJ 1132 b’s atmosphere using a variation on the “transit” planet-detection method, in which a world traverses the face of its star as seen from Earth. As the planet crosses its star, it blocks a small portion of the star’s total light and casts a planetary shadow toward our solar system. A planet’s atmosphere will absorb a tiny fraction of starlight around the shadow’s edges, filtering out certain wavelengths in accordance with its composition. Gathering enough light to discern this minuscule effect usually requires observing multiple transits using some of the world’s most powerful telescopes. Using the MPG/ESO 2.2 meter telescope at the European Southern Observatory in Chile, the team monitored nine transits of GJ 1132 b across a wide range of wavelengths, from optical to near-infrared. The measurements allowed them to line up a simple spectrum, which shows the amount of light at each wavelength. Their results showed extra absorption at certain wavelengths—indicating the possibility of water and/or methane in GJ 1132 b’s atmosphere in approximately equal proportions as is found in Earth’s air. Boasting a mirror some six times the size of the Hubble Space Telescope’s, JWST will be able to efficiently seek out signs of carbon dioxide and oxygen as well as water vapor and methane in some exoplanet atmospheres. Eager planet hunters, however, should not hold their breath for these breakthrough capabilities—JWST will not launch until October 2018, and the telescope has a full docket of other science objectives that will limit any time-consuming observations of exoplanets. This article is reproduced with permission from Scientific American. It was first published on Jan. 23, 2017. Find the original story here.